Sound familiar? It's good advice. Most pilots would agree that it's a good idea, and it's probably true that more accident pilots'not to mention their innocent passengers'might be alive today if they had followed it. So why didn't they? And why do so many pilots who appear for flight reviews or other training look sheepish and make excuses for why they haven't managed to write down their own personal minimums? There are probably many reasons that the concept of personal minimums is more honored as an idea than as a regular practice. I suspect, however, that a major reason is that many pilots'even safety-conscious ones'don't have a clear idea about where to start, and that many flight instructors'even conscientious ones'may not know how to guide pilots through the process of establishing personal minimums. I confess that I have been guilty on both counts. I consider myself to be a safety-minded pilot, but for too many years my personal minimums were little more than a vague mental notion. I also like to think of myself as a conscientious and safety-minded flight instructor (CFI), but far too few of my clients would be able to tell you that I even talked about, much less taught about, personal minimums. To make amends, here are some ideas that might help fellow aviators avoid similar sins of omission. Let's start with the basics. What exactly do we mean when we talk about 'personal minimums?' 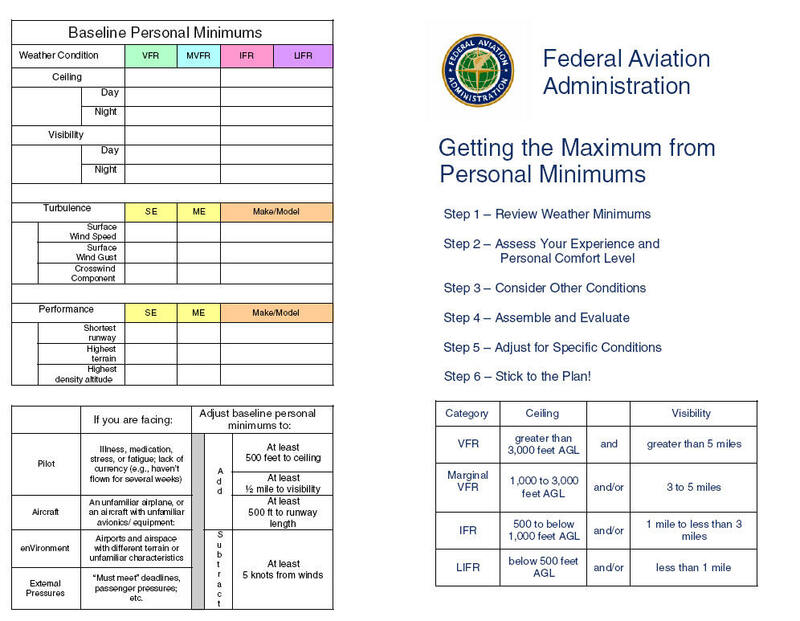 In formal terms, personal minimums refer to an individual pilot's set of procedures, rules, criteria, and guidelines for deciding whether, and under what conditions, to operate (or continue operating) in the National Airspace System. While this definition is accurate, there are several reasons why you may not find it particularly helpful as a starting point. First, it tends to describe the product rather than explain the process, which is where many pilots have trouble. Second, and more importantly, the formal definition of the end product'your personal set of procedures, rules, criteria, and guidelines'does not really convey one of the core concepts: personal minimums as a 'safety buffer' between the demands of the situation and the extent of your skills. Think of personal minimums as the human factors equivalent of reserve fuel. When you plan a flight, the regulations require you to calculate fuel use in a way that leaves a certain minimum amount of fuel in the tanks when you land at your destination or your alternative. The reserve fuel is intended to provide a safety buffer between fuel required for normal flight and fuel available to avoid total quiet in your engine compartment. 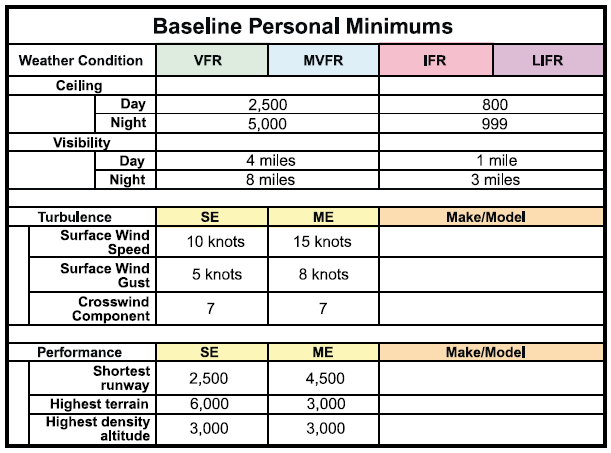 In the same way, personal minimums should be set so as to provide a solid safety buffer between the skills required for the specific flight you want to make, and the skills available to you through training, experience, currency, and proficiency. In fuel calculations, you wouldn't dream of planning a flight that would force you to use your reserve fuel, or (worse) take you to the 'unusable fuel' level in the tanks. In skill calculations, you shouldn't consider making a flight that requires use of skills at the 'reserve' or (worse) 'unusable fuel' level of your piloting ability. So where do you start in developing personal minimums? There is no single 'right' way to proceed, but if you're unsure of how to proceed in establishing your own personal minimums, this method offers a reasonable place to start. For our purpose, we will define IFR as a ceiling less than 1,000 feet AGL and/or visibility less than three miles. LIFR is a sub-category of IFR. 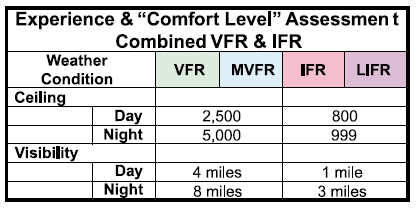 VFR is defined as ceiling greater than 3,000 feet AGL and visibility greater than five miles. MVFR is a sub-category of VFR. At first glance, this part of the process might look a bit complicated, but please bear with me. It might take a few minutes to review, record, and summarize your personal experience, but I think you will find that the finished product is well worth your time. First, think back through your flight training and complete the 'Certification Training, and Experience Summary' chart on the next page. The Certification, Training, and Experience Summary Source are adapted from the FAA's Personal and Weather Risk Assessment Guide (October 2003). 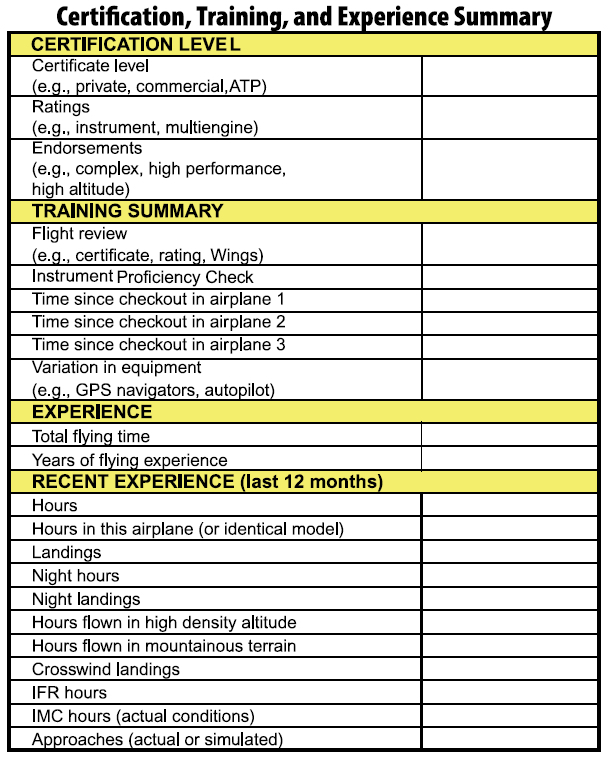 It can be found at: http://www.faa.gov/education_research/training/fits/guidance/media/Pers Wx Risk Assessment Guide-V1.0.pdf. Ceiling and visibility are the most obvious conditions to consider in setting personal minimums, but it is also a good idea to have personal minimums for wind and turbulence. As with ceiling and visibility, the goal in this step is to record the most challenging wind conditions you have comfortably experienced in the last six to 12 months'not necessarily the most challenging wind conditions you have managed to survive without bending an airplane. As shown in the chart to the right, you can record these values for category and class, for specific make and model, or perhaps both. In addition to winds, your 'comfort level' inventory should also include factors related to aircraft performance. Now you have some useful numbers to use in establishing baseline personal minimums. Combining these numbers the Baseline Personal Minimums chart on the next page shows how the whole picture might look. Note that the suggested adjustment factors are just that'a suggestion. If your flying experience is limited or if you don't fly very often, you might want to double these values. In addition, if your situation involves more than one special condition from the chart above, you will probably want to add the adjustment factor for each one. For example, suppose you are planning a night cross-country to an unfamiliar airport, departing after a full workday. 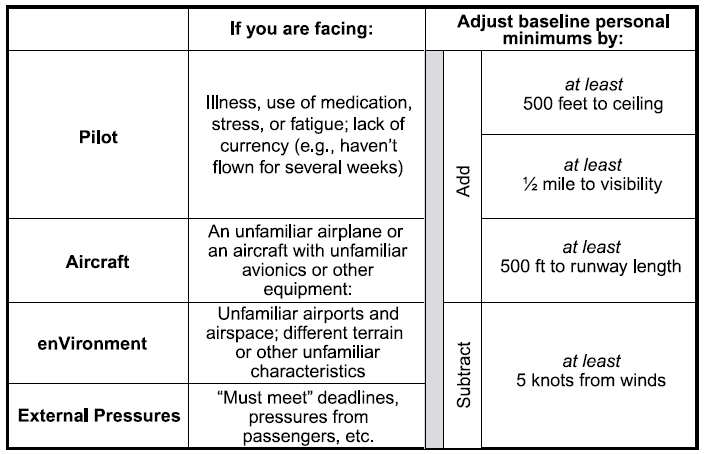 If you decide to make this trip'or you might decide that it is safest to wait until the next day'this chart suggests that you should at least raise your baseline personal minimums by adding 1,000 feet to your ceiling value; one mile to visibility, and 1,000 feet to required runway length. How about adjustments in the other direction? Some pilots fear that establishing personal minimums is a once and-for-all exercise. With time and experience, though, you can modify personal minimums to match growing skill and judgment. When you have comfortably flown to your baseline personal minimums for several months, you might want to sit down and assess whether, and how, to safely push the envelope. If, for instance, your personal minimums call for daytime visibility of at least five miles, and you have developed some solid experience flying in those conditions, you might consider lowering the visibility value to four miles for your next flight. First, never adjust personal minimums to a lower value for a specific flight. The time to consider adjustments is when you are not under any pressure to fly, and when you have the time and objectivity to think honestly about your skill, performance, and comfort level during last the few flights. Changing personal minimums 'on the fly' defeats the purpose of having them in the first place. You might find it helpful to talk through both your newly established personal minimums and any 'push-the-envelope' plans with a well-qualified flight instructor. Once you have done all the thinking required to establish baseline personal minimums, 'all' you need to do next is stick to the plan. As most pilots know, that task is a lot harder than it sounds, especially when the flight is for a trip that you really want to make, or when you are staring into the faces of your disappointed passengers. Here's where personal minimums can be an especially valuable tool. Professional pilots live by the numbers, and so should you. Pre-established hard numbers can make it a lot easier to make a smart 'no go' or 'divert' decision than a vague sense that you can 'probably' deal with the conditions that you are facing at any given time. In addition, a written set of personal minimums can also make it easier to explain tough decisions to passengers who, after all, trust their lives to your aeronautical skill and judgment.